In my CS class, the topic of creating an alignment chart (lawful good, lawful neutral, etc.) for programming languages came up. Let's decide in this thread how it would look, and once we have some consensus, I (or someone else) will post the result. Re: Programming Language Alignment Chart? Well, there's the clear mapping between static/dynamic typing and law/chaos. 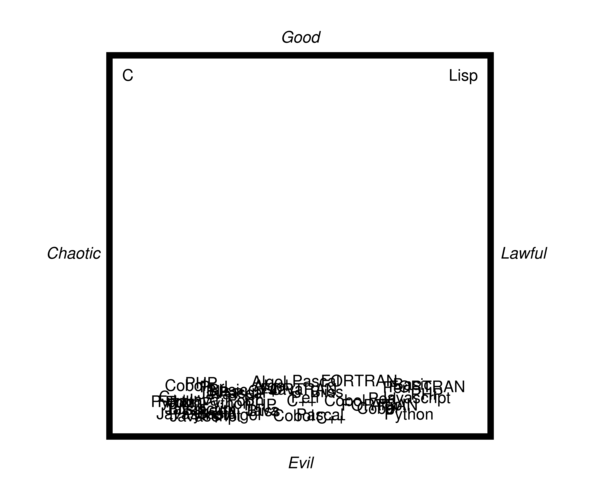 I would suggest that strict/loose typing maps to good/evil, but that's perhaps too much typing-related stuff. I agree that static/dynamic typing makes sense for the law/chaos axis. I don't think a good/evil axis can be defined without a full-scale war breaking out. For example, I think loose typing is good; Xanthir thinks it's evil. However, I do think it is important that any definition puts Brainfuck squarely on the "evil" side, so I'd suggest "readability" as a possibility. Of course, the question of "how readable is X" is a full-scale war in and of itself. Well XML itself isn't a programming language and there's not much you can say about it except for its syntax. Ajax is more a technique, so doesn't count either. chaotic good -> I don't know of anything at this extreme. Perl seems closest though. Not a strong opinion. Open for debate. Everything else falls between these corners. This being religious wars, I am of course, exactly correct. According to the above post, maybe Chaotic Good = J? I have hard time reconciling that as "good" though. It seems like anything of that ... esotericness is just bad. I don't understand why you're saying functional = lawful. Something like functional -> readable -> straightforward -> lawful? I dig your characterization of Python, but according to the above, maybe it should be lawful since it is strongly typed and has straightforward syntax. Hmm.. I'm probably using terminology wrong, but I didn't consider python/duck typing strongly typed as you can use objects however you want and any type problems won't become apparent until runtime. That seems enough for a chaotic rating, but maybe less so than some other scripting languages. Also there's a bunch of weirdness in the language just due to its history, e.g. http://docs.python.org/faq/design.html#why-does-python-use-methods-for-some-functionality-e-g-list-index-but-functions-for-other-e-g-len-list which seems kinda chaotic as well. Xanthir wrote: Well, there's the clear mapping between static/dynamic typing and law/chaos. I would suggest that strict/loose typing maps to good/evil, but that's perhaps too much typing-related stuff. Mat wrote: Hmm.. I'm probably using terminology wrong, but I didn't consider python/duck typing strongly typed as you can use objects however you want and any type problems won't become apparent until runtime. That seems enough for a chaotic rating, but maybe less so than some other scripting languages. I don't see how to map languages into two dimensions without so much loss of information, that languages not at all alike end up being labelled the same. "There's nothing either good or bad, but thinking makes it so." It's also missing something like Haskell, which may the epitome of the "lawful" end of the scale; I'd definitely say lawful good. The ML family also holds that corner... I'd say less lawful, but also a little gooder. Chaotic Typeful IMO, would be C / C++. "Lawful" languages stick with the principle of "There's only one way to do it" (Python's slogan). "Chaotic" languages stick with the principle of "There is more than one way to do it" (Perl's slogan). C/C++ are Chaotic because they have left so much of the standard up to interpretation. There can be massive differences between say... Keil C (embedded C), GCC, Visual C++, and Apple's Objective-C. All of these examples follow the C89 Standard, and yet code is not portable between them :-p. But thats the advantage of C / C++, they have so much of the language open for "undefined implementation details" that they are highly optimized for the platforms that they are designed for. I'd make the argument that ARM Assembly is Chaotic Typeful, given all of the different implementations of ARM. But keeping track of dwords, floats, and Thumb code and so forth definitely shows that ARM assembly has "types" conceptually in its language. Thanks to the principle of "More than one way to do it", there are a near infinite number of chaotic typeless programming languages. But its hard to think of Chaotic Typeful languages, because a type system almost innately restricts a language into doing things in a particular way. I think C++ is more of a true neutral language. confuciusdragon wrote: I think C++ is more of a true neutral language. I would call C true neutral. C++ is definitely chaotic. Furthermore, on similar grounds I would definitely argue that it's no more chaotic than C. C has several "chaotic" bits that are not in C++ (e.g. implicit conversions from void*), several more (e.g. casting) which have less-chaotic means to accomplish similar things, and few ways in which it's less chaotic. I think that implementation differences in templates in particular is about the one significant exception. I see C++ as pretty firmly in the neutral category on the lawful/chaotic axis. I agree that law/chaos would mostly be typing - both static/dynamic and various notions of "typing strength" (occurrence of unchecked type errors at runtime, implicit casts, etc, would be chaotic). I think good/evil must represent whether a programming language is benevolent (attempting to empower its users) or tyrannical (forcing the coder to code how it wants them to, persecuting or outlawing unapproved styles of programming). An archetypical expression of the latter is the omission of a goto construct from an imperative PL (the "final solution" to unsanctioned flow control)*. Low level languages (eg. assembly) tend to be neutral since they are neither empowering nor constraining. Languages with a balance of good/evil characteristics (eg. Python) are also classed as neutral on the good-evil axis. Alignment reflects only attitude and outlook, of course. Some good-aligned languages with very low INT, WIS and/or DEX may wreak havoc in their kingdoms simply due to their ineptitude. * Despite the genocidal nature of the policy, it would only imply neutrality - rather than evil - due to its prevalence. ** The gorgon Perl is commonly believed to be evil but is, in truth, benign. Its negative reputation stems from its extremely low charisma and the fact that its readers are sometimes turned to stone. You can't add them but you can multiply them. Makes it even more chaotic. Sometimes it's strongly typed and sometimes it isn't. I really can't understand what criteria some people are using for these alignments. That doesn't indicate weak typing. It just indicates operator overloading. More generally, whether Python is strongly typed depends on which of the many definitions of "strongly typed" you're using. In almost all cases, it is weakly typed - the claim that it's strongly typed seems to be based on the colloquial use of "strong typing" to mean "no implicit type casting". The strong/weak distinction is largely meaningless anyway. Good should be languages taught a lot in university and thought of as "elegant" but not used much in the real world, like Prolog or Scheme. Neutral (on the good/evil scale) should be languages used a lot in the real world, like Java or C#. Evil should be languages that people shudder to use (and not just because they were designed to be horrible as a joke, although those would be here too), like COBOL or Fortran. Definitely. Basically, are you allowed to write dirty hacks, or do you have to follow strict rules? That's pretty much an exact parallel to D&D - is it okay to break the rules for the greater good? I'd hardly call C lawful. It may be strongly typed, but clear and straightforward it isn't. C being chaos is the whole point of Java. Similarly, Perl being chaos is kind of the point of Python, so I'd be inclined to call Python at least neutral. It has some flexibility, but philosophy-wise, it's decidedly lawful. As for good/evil, that's tricky. We could just label obfuscated languages as evil, but that would leave an awful lot of good ones. It's also tempting to just label the ones you like as good, but that would hardly lead to any consensus. Maybe the best option is to equate "good" with "easy". So good languages would include modern kid-friendly things like Python and Ruby, as well as older languages made for beginners, such as Pascal and Basic, whereas evil languages would be those that typically takes longer to learn, like C, and of course Assembly. C is transcendent and cannot be circumscribed by your petty morality. Any language that contains both array_search($needle, $haystack) for array search and strpos($haystack, $needle) for string search must be chaotic evil. Lawful: has very strong opinions about how programs should be structured. Single-paradigm. File structure is enforced either by the compiler or by very strong convention. The answer to "how do I do things this other way?" is "you don't, do it the 'right' way". All codebases in the language have the same look-and-feel. Neutral: has no strong opinions about how programs should be structured. Programming-in-the-large features can be built from programming-in-the-small features in several different ways. File structure is ad-lib. Lots of "frameworks". Chaotic: program structure is completely up to the programmer. Aggressively multi-paradigm. "There's more than one way to do it". Look-and-feel varies widely across projects. Good: wants to help the programmer. Goes out of its way to make wrong code look wrong. Well-specified, good documentation. Helpful static analysis tools. Design philosophy is centred on developer experience above other considerations. Neutral: beyond good and evil. Design philosophy is centred on some "higher" goal than developer experience (functional purity, code aesthetics, a novel programming paradigm, etc.). The design philosophy is consistent, even when it means sacrificing dev experience. Evil: wants to hurt the programmer. Lots of inconsistencies and pitfalls. Poorly-specified. Static analysis is very difficult. Design philosophy is inconsistent and often sacrifices developer experience for ease of implementation.